3251. “Robert Robb Lee,” Find-A-Grave, https://www.findagrave.com/memorial/99889021, 99889021. 3252. “Pvt Oscar Smith Webb,” Find-A-Grave, https://www.findagrave.com/memorial/56436818, 56436818. 3253. Hans L Larson and Minnie A Nickel, “Iowa, County Marriages, 1838-1934,” June 13, 1917, Des Moines, Polk County, IA, USA, Reference ID: pg 209 , GS Film Number: 1749717 , Digital Folder Number: 004322062, https://familysearch.org/ark:/61903/1:1:KC45-VND. 3254. Stina Larsd, “Dödregister Korsberga-D1 (168408),” http://www.slaktdata.org/index.php?p=detail&sc...orsberga%201727-1920. 3255. Natt och Dag Family Association, “Släkttavla Ätten Natt och Dag,” http://www.nattochdag.org/doc/se/public/nattochdag.pdf, 2002. 3256. Virginia Colonial Abstracts, Volume III, Henrico County--Southside, 1736, Beverley Fleet, 3, 413, http://wc.rootsweb.ancestry.com/cgi-bin/igm.cgi?op...=lavere&id=I7417. Will of John WEB of Henrico Co., VA. Sick and weak. Died 27 April 1736. Probate 1st Monday in July 1736. 3257. Theodorick F Webb and Mary A Scott, “Virginia, Marriages, 1785-1940,” December 23, 1857, Franklin County, VA, Indexing Project (Batch) Number: M86877-5 , System Origin: Virginia-EASy , GS Film number: 31523, https://familysearch.org/ark:/61903/1:1:XRQX-CPR. 3258. 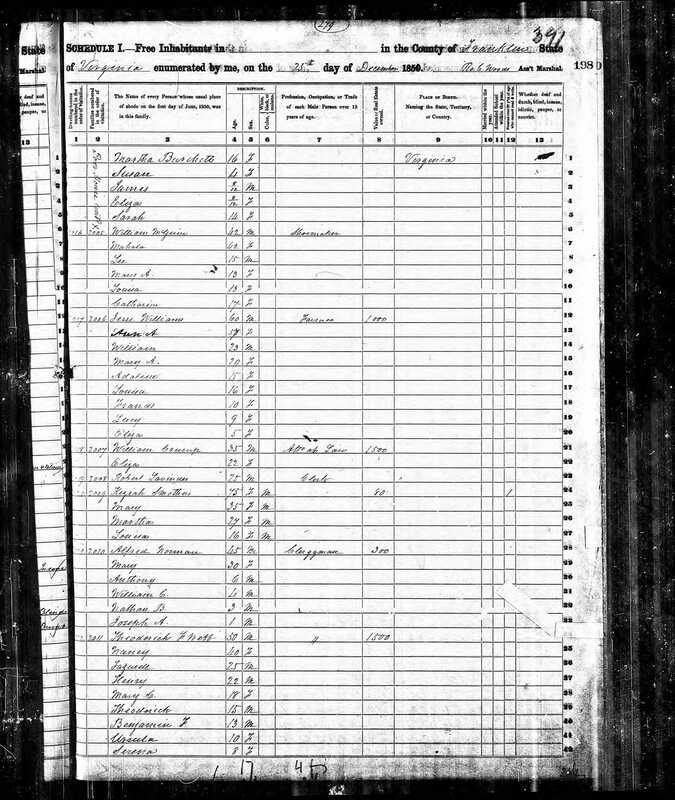 “United States Census,” 1850, VA, Franklin, 198A, M432, 944, 278, 399, Bureau of the Census, US Dept. of Commerce, United States of America, December 25, 1850, Robert C Woods. 3259. “Theodorick F Webb, Jr,” Find-A-Grave, https://www.findagrave.com/memorial/80687136, 80687136. 3262. “Theodorick Fitzgerald Webb, Sr,” Find-A-Grave, https://www.findagrave.com/memorial/80597376, 80597376. 3263. “Elizabeth Webb Webb,” Find-A-Grave, https://www.findagrave.com/memorial/80730492, 80730492. 3264. “Sarah Huff Walker,” Find-A-Grave, https://www.findagrave.com/memorial/80602331, 80602331. 3265. “Nancy C Webb Beard,” Find-A-Grave, https://www.findagrave.com/memorial/80645976, 80645976. 3266. “Ursula “Ursey” Webb Greer,” Find-A-Grave, https://www.findagrave.com/memorial/70749878, 70749878. 3267. “Bird S Webb,” Find-A-Grave, https://www.findagrave.com/memorial/70744104, 70744104. 3268. “Creed T Webb,” Find-A-Grave, https://www.findagrave.com/memorial/80655889, 80655889. 3269. “Mahala F Booth Webb,” Find-A-Grave, https://www.findagrave.com/memorial/80710455, 80710455. 3270. “Cuthbert Webb,” Find-A-Grave, https://www.findagrave.com/memorial/104478381, 104478381. 3271. “United States Census,” 1880, TN, Putnam, District 1, 16D, 2, 100, T9, 1275, 84, 174, 10th Decennial Census Office, Bureau of the Census, US Dept. of Commerce, United States of America, June 10, 1880, A W Boyd, District 01. 3272. John Benton Choat and Agnes Tressa Ward, “Indiana Marriages, 1780-1992,” January 31, 1920, Marion County, OH, Indexing Project (Batch) Number: M01501-8 , System Origin: Indiana-EASy , GS Film number: 499419 , Reference ID: 92, https://familysearch.org/ark:/61903/1:1:XF8Y-GZB. 3273. James W Sorrells and Olive T Gillahan, “Indiana Marriages, 1780-1992,” May 29, 1916, Indianapolis, Marion County, OH, Indexing Project (Batch) Number: M01219-9 , System Origin: Indiana-EASy , GS Film number: 499408 , Reference ID: 672, https://familysearch.org/ark:/61903/1:1:XFHQ-DXK. 3274. 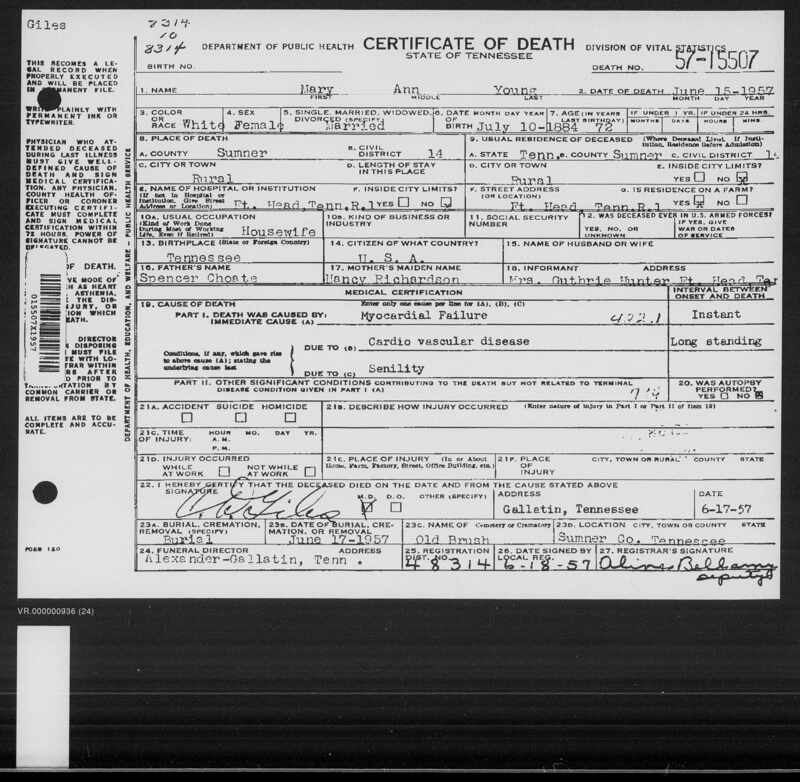 Mary Ann Young, “Tennessee, Death Records, 1914-1955,” June 15, 1957, Rural, Sumner County, TN, GS Film Number: 001708791 , Digital Folder Number: 007552335 , Image Number: 00942, https://familysearch.org/ark:/61903/1:1:QKM9-LY8H. 3275. 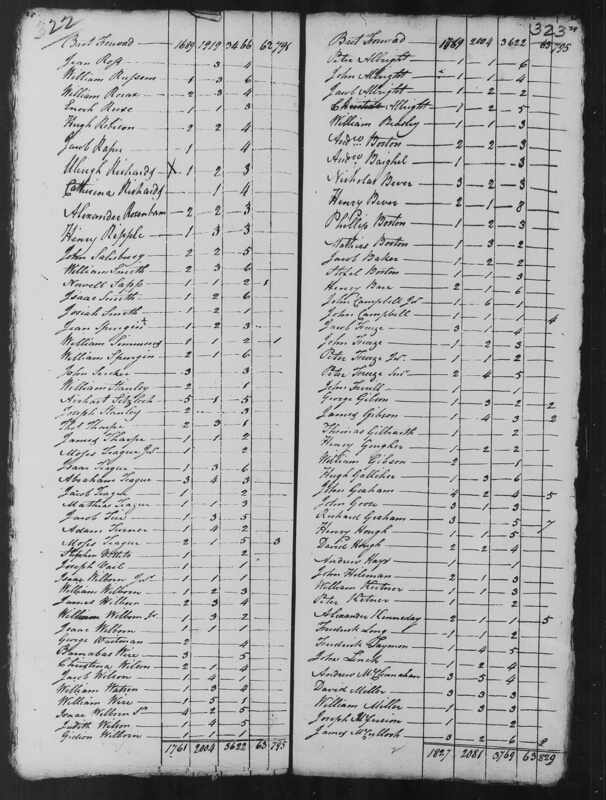 “United States Census,” 1790, NC, Rowan, M637, 7, 322, 519, Bureau of the Census, US Dept. of Commerce, United States of America. 3276. “Mrs. Tanner, Resident of State 50 Years, Dies,” Alice E Tanner, The Lincoln Star, Lincoln, NE, May 16, 1933, 8. Mrs. Alice E. Tanner, 71, resident of this vicinity for fifty years, died Tuesday morning at her home, Seventieth and Vine streets. Shortly after her marriage at Pontiac, Ill., Mrs. Tanner came to Nebraska with her husband settling at Bennett. A short time later the family moved to a farm north of Palmyra where they lived for nearly twenty years. Thirty-one years ago they moved to the present home. Throughout her life, Mrs. Tanner took an interest in gardening and cultivated an extensive flower garden. Surviving are her husband, with whom she celebrated her golden wedding anniversary last October 26: two sons, Charles and Clarence, both of Lincoln, three sisters. Mrs. Lillian Adair, San Antonio; Mrs. Clara Frey of Lincoln. and Mrs. Jennie Sidles of Hastings, and four grandchildren. 3277. “Mrs. Laura Berry, Ex-Lincoln Resident, Dies at Boise, Ida.,” Laura Berry, The Lincoln Star, Lincoln, NE, April 22, 1933, 2. Mrs. Laura Berry, 68, former Lincoln resident, died in Boise, Ida., Friday night, according to word received here Saturday by her twin sister, Mrs. Clara Frey, 1417 O Street. Mrs. Berry had been in ill health for several months. She is survived by her husband, Dorvan Berry, two sons, Glenn and Sheral, all in Boise, and another sister Mrs. Alice Tanner of Bethany. Mrs. Berry lived in Lincoln for a number of years while her husband was engaged in business here. She was a former member of the Grace Methodist Church. 3278. “Ida Jane “Jennie” Sidles,” Find-A-Grave, https://www.findagrave.com/memorial/39642579, 39642579. 3279. “Sarah Elizabeth Lowry Sidles,” Find-A-Grave, https://www.findagrave.com/memorial/39641795, 39641795. 3280. “Charles Zorn Sidles,” Find-A-Grave, https://www.findagrave.com/memorial/6223845, 6223845. CHARLES Z. SIDLES, who is well and favorably known as one of the enterprising and prosperous farmers of Palmyra Precinct, operates 320 acres of good land on section 22. He was born in Somerset County, Pa., in October. 1838, and was the fourth of nine children born to Daniel and Catherine (Zorn) Sidles, both of whom were natives of Pennsylvania. By occupation his father was a blacksmith, but became an extensive land-owner in Pennsylvania. In 1850 he removed to Stephenson County, Ill., and continued to work at his trade, and later lived a retired life in Dakota, Stephenson County, where he died in 1879, at the age of seventy years. His wife, the mother of our subject, is still living, and is seventy-four years of age, and is making her home with her daughter, Mrs. Springman, of Palmyra Precinct. The family record gives the names of the children of this family as follows: Emeline M., Henry, Charles Z., Frank A., Sarah, Julia, Rebecca, Mary and Daniel. The education of our subject was limited to two terms, when he attended the usual institution in Stephenson County. He early began to help his father and to work upon the farm, which he continued until he came of age. He then took and operated a farm on shares in Stephenson County. He received the hand of Miss Sarah Lowery in marriage in that county on Oct. 25, 1860. This lady is the daughter of Godfred and Mary Ann Lowery, both born in Pennsylvania; they were the parents of five children, their daughter Sarah being the eldest. She received a good English education and a careful home training, that has borne fruit since she has had a home of her own. They are the parents of the following children: Emily Alice, Ellen Jennie, Clara A., Laura A., Lillie and Willie. The three eldest children of our subject were born before the war, which broke out while Mr. and Mrs. Sidles were residing upon their farm near Freeport. In 1864 Mr. Sidles enlisted as a private for a term of three years, or during the war, as required. He became a member of Company E, 46th Illinois Infantry, and was mustered into service at Baton Rouge, was present at Vicksburg, from which place they went to Shreveport, La. During his term of service he was with his regiment in Mississippi, Louisiana, Texas, Arkansas and Alabama. He was at Mobile at the time of Lee's surrender, and was present at the blowing up of Ft. Fisher, and was mustered out of service at Baton Rouge, in July, 1866. Returning home Mr. Sidles sold out his interest in eighty acres of land in Stephenson County, the purchaser being his brother Frank. In 1878 he went to Livingston County, Ill., and became the owner of a farm of 120 acres, which he sold in 1884, and in the spring of that year came to this State. Of the family of our subject, Alice has become the wife of Samuel Tanner, and is the mother of one child, whose name is Charles; Ellen has become Mrs. Arthur Thompson, and she also has a son, bearing the name Charles; Clara is the wife of Clarence Frye, a florist at Lincoln, and Laura is married to Mr. Berry, of Lincoln. Mrs. Sidles is a member in good standing of the Methodist Episcocal Church, and is held in high regard. The political sympathies of out subject lead him to affiliate with the Republican Party, of which he is an ardent supporter. Charles Zorn Sidles and Sarah Elizabeth Lowry were united in marriage in Stephenson Co., Illinois on October 25, 1860. His siblings were: Emeline M., Henry, Frank A., Sarah, Julia, Rebecca, Mary and Daniel. Infant son - died 1870. 3281. “Frank Aaron Sidles,” Find-A-Grave, https://www.findagrave.com/memorial/6357152, 6357152. Daniel, who was a blacksmith, is a native of that State. His grandfather Sidles, came from Germany. His mother, Catherine Zorne, was a Pennsylvanian, and as far back as the maternal ancestry can be traced they were natives of the same State, being among the early settlers of the town of Berlin. The family consisted of nine children, Emmeline, Sarah, Julia, Henry, Charles, Frank Aaron, Rebecca, Mary and Daniel. When Frank attained his twelfth year, the family moved West, locating in Freeport, Ill., where he was educated and raised to manhood. His father pursued his vocation, that of a blacksmith, for many years, and was well and favorably known throughout Stephenson County. 3282. 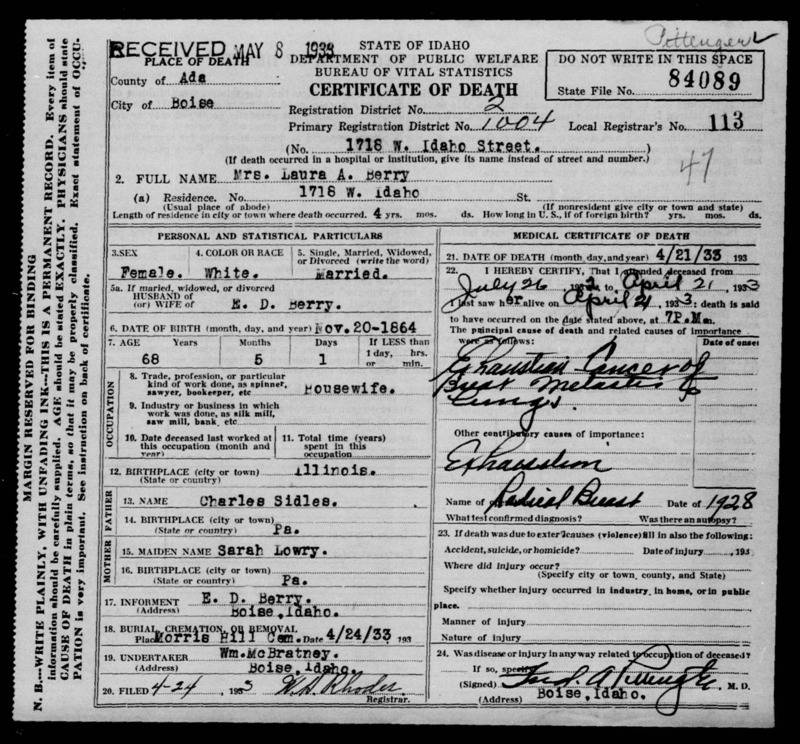 Larua A Berry, “Idaho Death Certificates, 1911-1937,” April 21, 1933, Boise, Ada County, ID, GS Film number: 1530915 , Reference ID: cn 84089, https://familysearch.org/ark:/61903/1:1:FLRB-T19. 3283. “Laura Ann Berry,” Find-A-Grave, https://www.findagrave.com/memorial/59467330, 59467330. 3284. “E Darwin Berry,” Find-A-Grave, https://www.findagrave.com/memorial/61697990, 61697990. 3285. 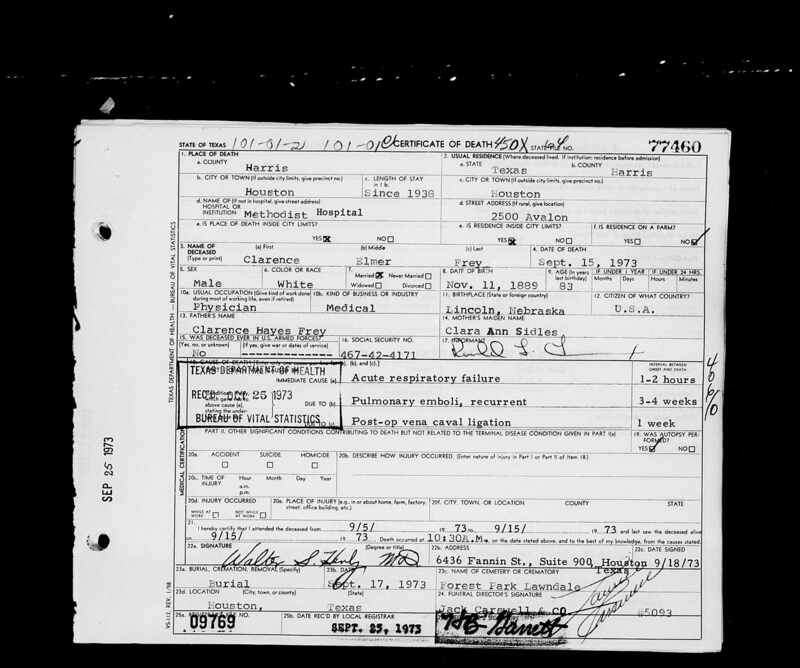 Edwin Darwin Berry, “Idaho Death Certificates, 1911-1937,” July 31, 1936, Boise, Ada County, ID, GS Film number: 1530932 , Reference ID: p 99907 cn 243, https://familysearch.org/ark:/61903/1:1:FLT8-17M. 3286. Dean Thomson, “Family Heritage of Dean Thomson,” http://worldconnect.rootsweb.ancestry.com/cgi-bin/...tonmagna&id=I425, May 29, 2007. 3287. 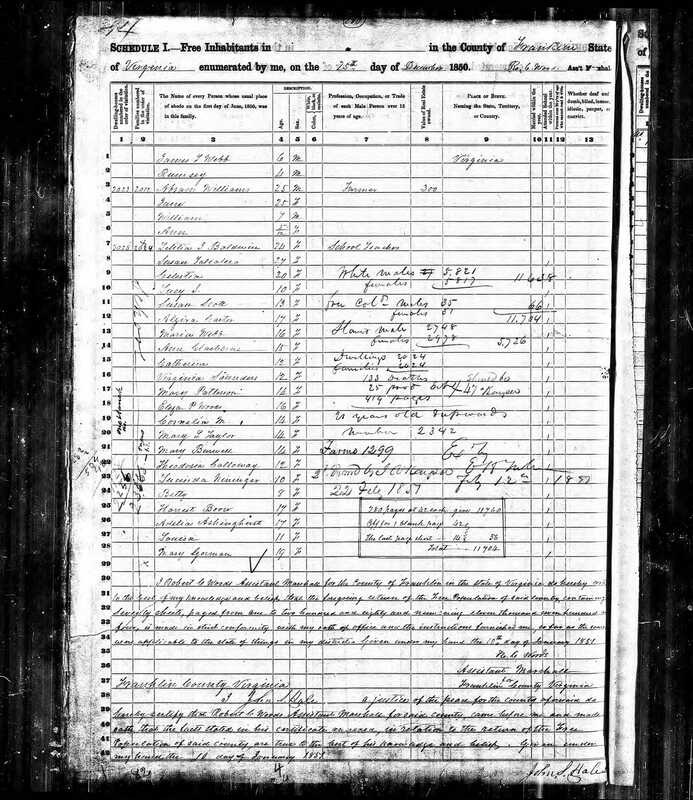 Clarence Elmer Frey, Nebraskana, 1932, 432, http://www.usgennet.org/usa/ne/topic/resources/OLL...a/pages/nbka0112.htm. Clarence E. Frey was born at Lincoln, Nebraska, November 14, 1889, the son of Clarence Hayes Frey and Clara Ann (Sidles) Frey. His father, who was born at Carlisle, Pennsylvania, July 27, 1865, was a pioneer florist in Lincoln, where he founded the firm of Frey and Frey. This florist establishment was Lincoln's largest retail and wholesale business. He is now retired. H. H, Frey, father of Clarence H. Frey was a florist of Dutch descent; his mother, who was English, was a teacher. Dr. Frey's mother was born in Stevenson County, Illinois, November 20, 1864. She was the daughter of Charles Sidles, a Civil War veteran, and Sarah Lowery Sidles. Now an invalid she has been very active in Methodist church work. Dr. Frey attended the Lincoln grade schools, the normal high school and Nebraska Wesleyan Academy. He was a student at Nebraska Wesleyan University, and the College of Pharmacy of the University of Nebraska, and 1919 was granted his M. D. at the Eclectic Medical College at Cincinnati, Ohio. He was president of Franklin Literary Society at Wesleyan University. After serving as interne at the Christ Hospital at Cincinnati for two years, Dr. Frey was resident physician at St. Elizabeth's hospital at Lincoln for one year. He is now engaged in private medical practice and is a member of the staff at St. Elizabeth's Hospital. He is the author of numerous medical articles and a book, Shep, a child's story of a dog, published in 1899. He was married to Julia Elizabeth Van Pamele at Omaha, Douglas County, Nebraska, January 23, 1913. Mrs. Frey, who was born at Patterson, New Jersey, May 12, 1892, is a descendent of the house of Noe of the Belgian nobility. They have one son: Clarence Van Pamele, born March 2, 1914, who is a student at Lincoln High School; he has written some promising poetry which has been published. Dr. Frey is a member of the Lancaster County Medical Society, the Nebraska State Medical Society, American Medical Association, Elkhorn Valley Medical Society, International Postgraduate Medical Society, and the Missouri Valley Medical Association. He is a member of the National Geographic Society and the American Association for the Advancement of Science, the Lincoln Chamber of Commerce, the Red Cross, and the Anti-Saloon League of Nebraska. He is a Mason, member of Ben Hur, and the Yeoman. His hobbies are the study of philosophy, psychology, and bee-keeping. Residence: Lincoln. 3288. 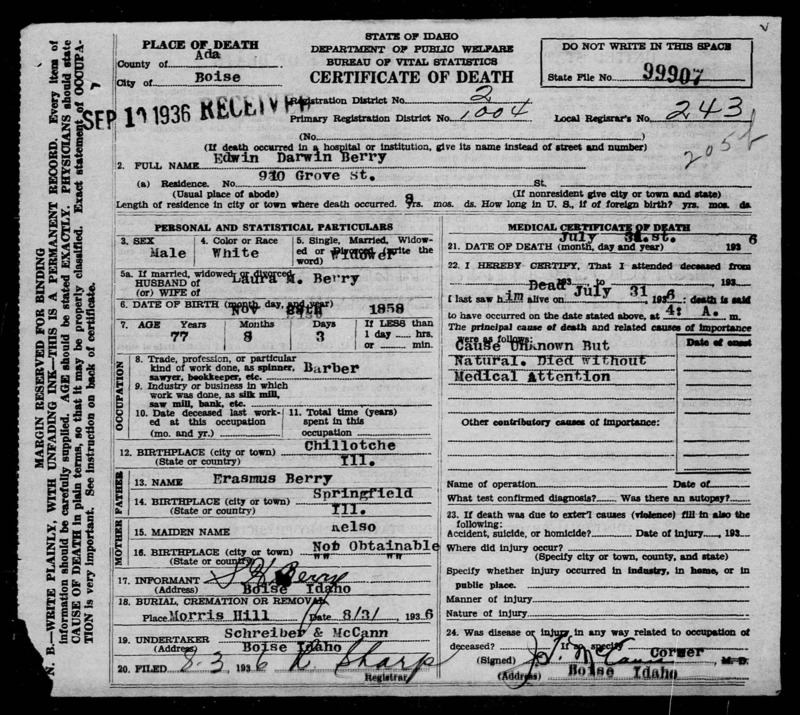 Clarence Elmer Frey, “Texas, Deaths, 1890-1976,” September 15, 1973, Houston, Harris County, TX, GS Film number: 2242914 , Digital Folder Number: 005145841 , Image Number: 02013, https://familysearch.org/ark:/61903/1:1:K3DH-FFV. 3289. “Clara Ann Sidles Frey,” Find-A-Grave, https://www.findagrave.com/memorial/136235083, 136235083. 3290. “Dr Clarence Elmer Frey,” Find-A-Grave, https://www.findagrave.com/memorial/82099942, 82099942. 3291. “Clarence Hayes Frey,” Find-A-Grave, https://www.findagrave.com/memorial/82100179, 82100179. 3292. 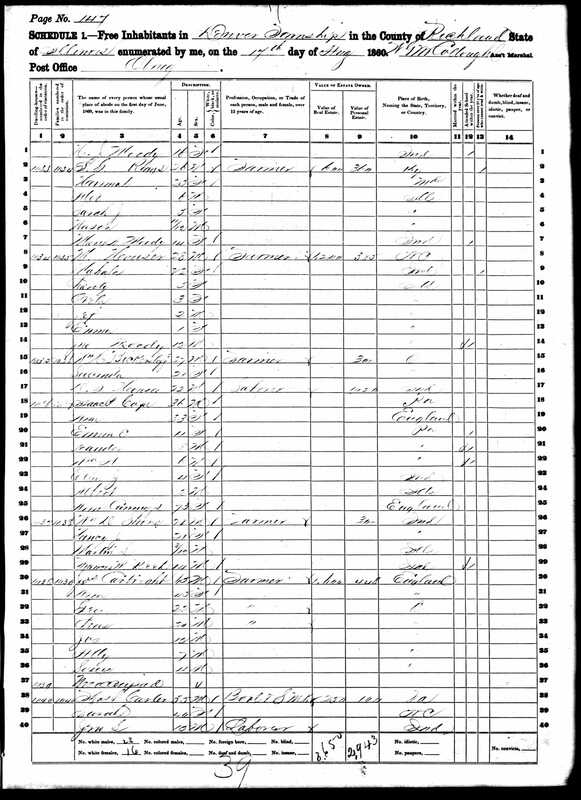 Lillie Aithusa Sidles, “Illinois Births and Christenings, 1824-1940,” August 15, 1874, Livingston County, IL, Indexing Project (Batch) Number: I01341-8 , System Origin: Illinois-ODM , GS Film number: 1392963, https://familysearch.org/ark:/61903/1:1:V2LM-1TP. 3293. “Roy E Tanner,” Find-A-Grave, https://www.findagrave.com/memorial/101142083, 101142083. 3294. “Helen M Tanner,” Find-A-Grave, https://www.findagrave.com/memorial/26066443, 26066443. 3295. “Sally Marie Tanner Westerdale,” Find-A-Grave, https://www.findagrave.com/memorial/142092561, 142092561. 3297. “Obituaries,” Lula M Tanner, Green River Star, Green River, WY, February 11, 2015. Lula M. Tanner, 90, of Rock Springs, passed away on Thursday at the Memorial Hospital of Sweetwater County. A resident of Rock Springs since 1945 and former resident of Green River, Rawlins, Nebraska and Oklahoma,;Tanner passed away following a lengthy illness. She was born on Feb. 24, 1924 in Picher, Okla ., the daughter of the late Charles Edward Bigley and Nora Louise Leftridge. Tanner attended schools in Auburn, Neb. She married Leslie Gene Tanner in Omaha, Neb. on June 9, 1943 and he preceded her in death. Tanner owned and operated several businesses in Green River and Rock Springs and was also a homemaker. She was a past chairman for several years in the 1960s for the Green River March of Dimes in Green River. Her interests included spending time with her family, especially her grandchildren and great-grandchildren, embroidery work, gardening and the outdoors. She always looked forward to parties and get-togethers with her family and friends. Survivors include one daughter, Patricia J. Kappes and companion Chuck Banas of Rock Springs; seven grandchildren, Dr. Bonnie Randolph and husband Robert of Torrington, Burleigh Binning III and wife Jodie and Billie Eckhardt and husband Jay, all of Laramie, Henry C. Kappes Jr. and wife Elizabeth of Germany, Charlotte Piaia and husband John and Adam Kappes and companion Diana Walter, all of Rock Springs, and Rebecca Reinhart and husband Marshall of Humboldt, Ill .; 11 great-grandchildren Robert P. Randolph, Anya Randolph, Joseph Randolph, Timothy Randolph, Zoe Emerson, Paige Emerson, Carter Eckhart , Beau Eckhart, Ashlyn Piaia, Britney Kappes, Elizabeth Kappes, Samatha Binning and Tinsley Binning; several nieces and nephews including Don and Nancy Bigley, Kenny Bigley, Larry Dean Harris, Debra Dean, Karlene Brueggemann, Janet Sobotka, and Jeanie Hansford. She was preceded in death by her parents, husband Leslie G. Tanner; three brothers, Melvin Bigley, Charles Bigley and James Bigley; four sisters, Veronia Bardwell, Marie Hubbard, Barbara Harris and Joan Schutz; two daughters, Anna Mae Kappes and Linda Lou Binning and two granddaughters, Anna Marie Kappes and Janet Louise Kappes. The family of Lula M. Tanner respectfully suggests that donations in her memory be made to Deseret Health and Rehab, 1325 Sage Street, Rock Springs, Wy. 82901. The funds will be used for a blanket warmer. Pallbearers: Adam Kappes, Chuck Banas, Burleigh Binning III, John Piaia, Robert Randolph and Jay Eckhart. 3298. 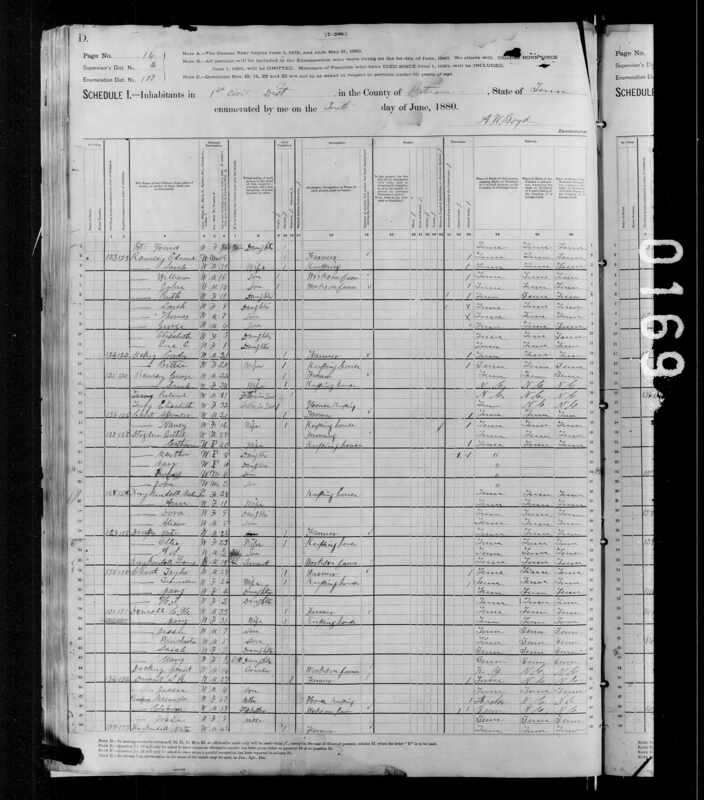 “United States Census,” 1860, IL, Richland, Denver, M653, 222, 147, 3, Bureau of the Census, US Dept. of Commerce, United States of America, August 14, 1860, W G McCollough. 3299. “Timothy Houser,” Find-A-Grave, https://www.findagrave.com/memorial/83811294, 83811294. 3300. “Sarah Crater/Greter Houser,” Find-A-Grave, https://www.findagrave.com/memorial/83834770, 83834770.